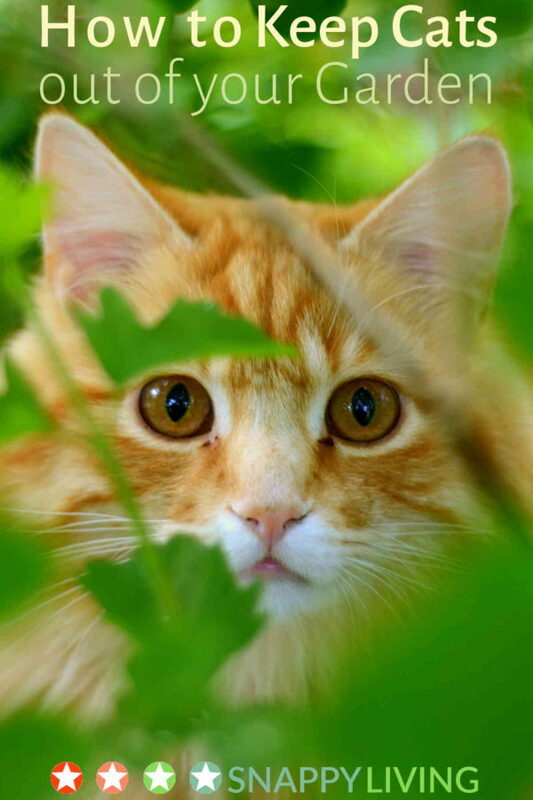 Outdoor cats often stray into other people’s gardens, where they can make a mess and wreck what you’re trying to grow. This is a seriously frustrating problem for many gardeners. Fortunately, there are some simple, cheap and perfectly humane steps you can take to keep cats out of your garden. What all these steps boil down to is simply making your garden less inviting to cats – without making it unattractive to anybody else. These are fairly easy tasks that don’t cost you anything, but may be inconvenient. If they poop, get rid of it. This reduces their sense that your garden is their litterbox. Also, because cats are carnivores, their poop can pass on to humans any diseases their prey had. You really don’t want cat poop in your soil, especially if you’re growing food. Most cats don’t like water or mud, and there are a couple of humane ways to use this to your advantage. Do not shoot directly at them with a garden hose – it can be forceful enough to hurt a cat. Keep a toy water gun handy and shoot at them with that. In a pinch, you can shoot just in front of them with the garden hose, creating a wet spot they won’t want to cross. Put large flat stones around your garden to make it harder for cats to go digging. Decorative pine cones can be pushed down into the soil around your plants to make your garden less comfortable for cats to dig in. These steps may cost a little money up front, but work effectively without any effort on your part beyond set up. If you’re just starting to plant, put a sheet of chicken wire over your soil or mulch before you begin to plant (with wire cutters, you can open up sections of the chicken wire, plant your plants, and then close the chicken wire back down). Cats don’t like walking on chicken wire, so it will take a pretty big temptation for them to bother getting that close. Cats also don’t like citrus, particularly orange, so spray some orange oil around areas you want them to leave alone. This is a safe product that actually repels cats effectively, although you will have to re-apply it every few weeks. You can also dust the ground with ground plants cats dislike. Like cayenne pepper, black pepper, dry mustard, lavender, rue, peppermint, geranium, lemon verbena, absinthe, pennyroyal, lemon thyme, garlic and citrus rinds. You can also plant any of these plants in your garden to keep cats out of your garden. Plant Coleus canina, otherwise known as “scaredy-cat plant”, in your garden. It puts off a smell that doesn’t agree with cats at all. Of course you can’t always be around when the cats visit. You can get motion-activated sprinklers that sprinkle your garden every time something moves. To a cat, it will seem like a tiny localized rainfall – gentle, but repulsively wet. Or use ultrasonic motion-activated animal repellents that emit a sound which startles cats but is inaudible to humans. I’ve found these really help to keep cats out of your garden. You may have heard that putting mothballs in areas you want cats to keep away from is a humane method. Moth balls are actually toxic to many animals, so you’ll need to put them in a closed container with some small holes to let the scent out. But even then, small children who can unscrew the jar lid could get into your mothballs and eat them. While this method can work, it’s no better than the others and carries some risks. These are great tips. I have a few stray cats. They don’t dig, but they love to lay in one of gardens. I’m going to try spraying the orange oil. I’m going to start saving my tea bags too. I do save my coffee grounds for my vegetable garden. I wonder if they would work? Thanks for sharing. I don’t know for sure if the coffee grounds keep animals away, but I’ve wondered. I used them on my veggies last year, and I was surprised that both cats and rabbits left everything alone.